Nesting is a phase that can occur sometime between the conception of your child and birth. It’s a period when moms feel an urge to get the nursery organized, decorated, and fully ready for the baby. It may include harmonious decorations that are worthy of being pinned on Pinterest. Decorating a nursery can be fun, but it’s also easy to go overboard. When you’re on a budget, you have to observe certain constraints to avoid overspending. Here are some tips that will help you stay on track. If you know what you can spend ahead of time, you’ll find it easier to stay within the limits. Come up with a reasonable budget that will enable you to design a beautiful nursery without overspending. Because infants grow so quickly, you can often find affordable baby items for sale at thrift stores, online, at garage sales, and on second-hand trading sites. Hunting up nursery furniture and décor at a fraction of the price they would cost if purchased brand new can be both easy and fun. Remember that if the furniture doesn’t match, you can always refinish the pieces so they do. Follow an online tutorial about how to refinish nursery furniture, so you do it safely and the labor is non-toxic. 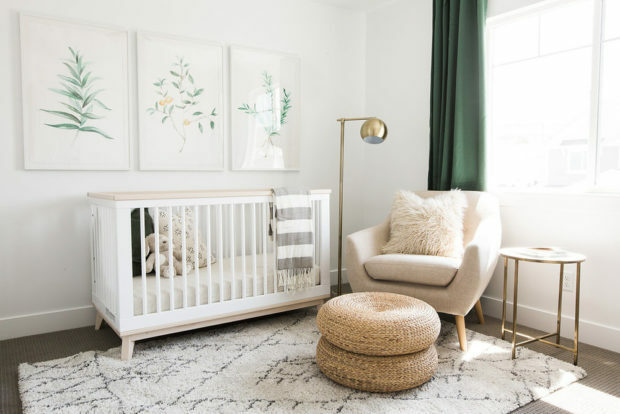 If you’ve already decorated your nursery and you’re simply looking for a change, think about asking other moms whether they’re ready to switch it up also. They might be willing to swap décor items, so that each of you gets a new nursery without having to spend a dime. Think in terms of the long haul when you decorate the nursery. If you’re planning to have more children, select items that will work for either gender. That way, you won’t have to overhaul your frilly pink nursery completely if your next child turns out to be a boy. In addition, go for items that will last long term. “Instead of opting for furniture that looks like it’s made for a baby’s room, choose pieces that will grow with your child,” advises Linda Diproperzio of Parents.com. Another long-term item worth purchasing is a convertible crib. These models can be used for a toddler bed frame and then a twin-size. They grow with your child so you don’t necessarily have to buy a new item every couple of years. Of course these cribs are more expensive than the regular ones, but the long-term investment may make them worth it. The American Academy of Pediatrics has laid out strict guidelines regarding your crib setup. “Parents should never place the baby on a sofa, couch, or cushioned chair, either alone or sleeping with another person,” states a report by the AAP. The academy’s recommendation is part of its effort to reduce the incidence of Sudden Infant Death Syndrome (SIDS). The AAP discovered that babies who sleep in bedding without potential for suffocation by pillows or blankets have shown significantly lower risk for SIDS. So there’s not much point in buying expensive comforter sets. You won’t be using them anyway. If you don’t mind doing some of the work yourself, you might consult online tutorials for cute crafts to hang up in your nursery. Set aside a Saturday for crafting child-friendly decorations. You can make dozens of items for less than $10 apiece, whereas it might have cost $50 to buy them retail. This is what budget-decorating is all about: using your resources to get the nursery of your dreams.